De Havilland DH 100 Vampire – British jet fighter warplanes. British jet fighter planes De Havilland Vampire DH 100. De Havilland Vampire (back) of the historical squadron of the RAF and the last machine of this type which is able to fly, together with a Gloster Meteor (front). Type: British jet fighter planes. The de Havilland Vampire was the first true design for a British jet fighter plane. That demanded a completely new classification of the individual assemblies to each other. Frank Halford had designed a jet engine, called H 1 and later Goblin, with a thrust of about 2,530 lb. The aircraft designers found this sufficient for a small fighter with one engine. They constructed a short torso, where the pressure cabins was in front of the engine. The tail was carried by two thin legs and the horizontal stabilizer was above the exhaust jet. The prototype was the first Allied aircraft which reached 500 mph, but the first production aircrafts didn’t reach the squadrons during WW2. Because the De Havilland company had no free capacities, these were built by English Electric. De Haviland Vampire F1 from No.247 Squadron RAF, used March 1946 to February 1949. Vampire FB5 from No.614 Squadron RAF, used from December 1951 to March 1957. 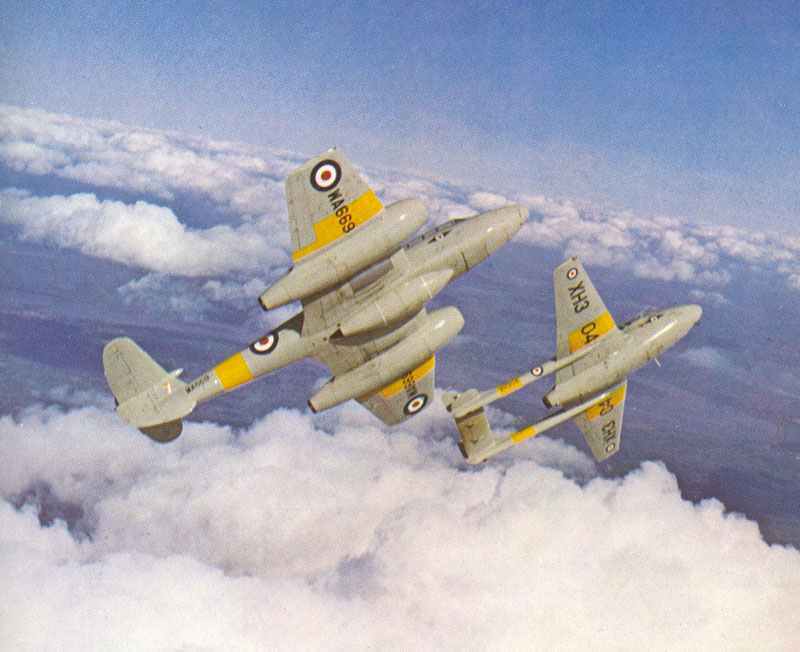 Vampire NF10 night fighters from No.23 Squadron RAF, used from September 1951 to January 1954. 3D model De Havilland Vampire. This first jet fighters were replaced by the F 3, with a typical DH-tail, lowered horizontal tail and more fuel capacity. The FB 5 had straight wing ends with wing rackets and the FB 6 was an export model which was built in Switzerland. There were a huge range of export models, such as the Australian FB 30 with Nene engine and air entrance on the body, or the French Mistral SNCASE with Hispano Nene engine and enlarged air entrances at the wing roots. The final version of the RAF was the tropicalised FB 9. Also a Sea Vampire F 20 was built in small numbers. The total production figure, including all variants, amounted to 4,206 – more than any other British post-war aircraft. Tagged 1945, de havilland, fighter-bomber, jet, raf, single-seat fighter, uk.